Um, what's better than Nutella? 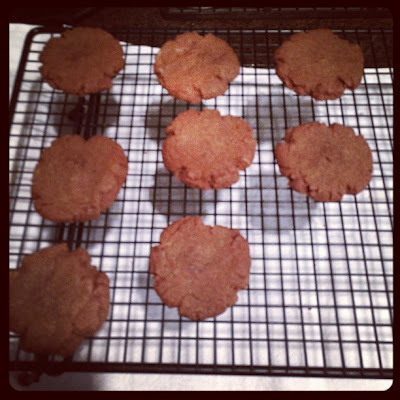 Why Nutella cookies, of course!! If you are as much a fan of the delicious hazelnut chocolate spread as I, you'll absolutely adore making your whole house smell of divine goodness with these cookies! I would love to make a Nutella scented candle, if that is even possible! What's great is that not many ingredients go into this recipe, making it easy to whip up! All you need is Nutella (of course), 1 cup, 1 egg, 1 cup of flour and 1/2 cup of sugar. I have to say, working with Nutella is a tiny bit challenging, due to its thickness. I found the dough to be rather difficult to work with, so I advise adding 1/8 cup of water will help make the dough from a crumbly mess to a more manageable texture. I do not take credit for this recipe, which I share in a second. One more thing to mention, the instructions suggest baking for 8 minutes-this was not long enough for me, and I upped to 10-12 minutes, watched carefully, and let my nose also tell me when they were done. And boy are they yummy! They kind of have the texture of brownies, and oh so good, especially when washed down with a glass of milk. Here's the link to the recipe I promised! Happy baking & Happy Holidays!